Social media. We all love it, especially for our business, but social media can be utterly time consuming and exhausting to keep up with. Because social media is so readily accessible on our phone, we’re connected to it more now than ever. 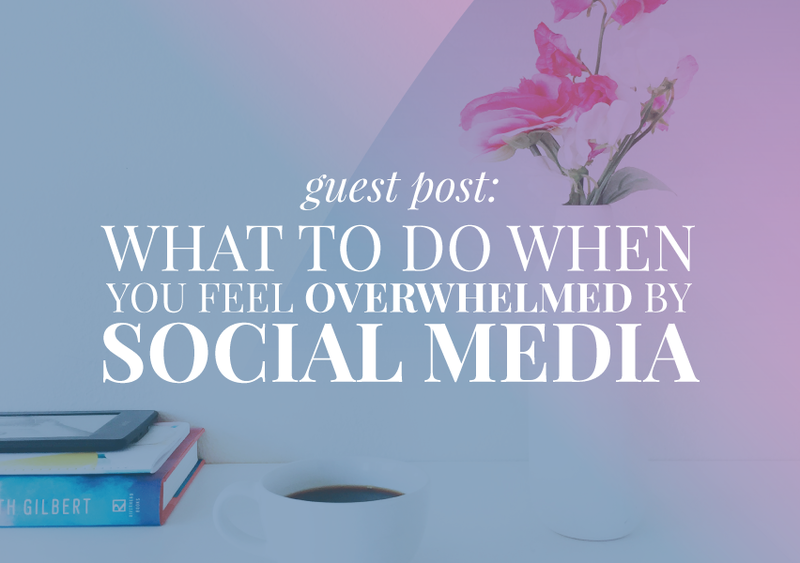 It sounds like a good, but when we constantly feel that we need to be plugged in and up to date with every new post out there, well… doesn’t that just sound overwhelming?! If you’re running a business, you know how important it is for you to have a consistent presence on social media. But if you’re trying to keep up with social media all the time, it doesn’t leave you much room for anything else, work-wise and personal-wise. Not all is lost though! There are a few easy to implement tips for you to do in order to get control over your social media. If you’re just posting whatever and whenever, you’re not doing yourselves any favor. Instead of posting randomly, take the time to develop a strategy. To do this, you want to consider which platforms you want to put more of your efforts towards. Take a look at your website’s stats. If you use Google Analytics, you can check what social media platforms are bringing you the most traffic under Acquisition > Social > Overview. Focus on the 1-2 (preferably 2) platforms that already bring you the most traffic. Spreadsheets are everything in my business. 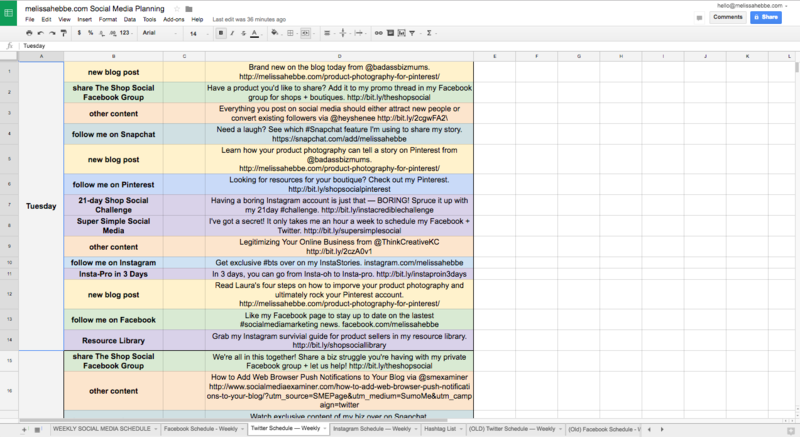 I use spreadsheets to plan out all of my Facebook content and Twitter content. In fact, I can schedule out one week’s worth of content in just one hour a week! Here’s a screenshot of what my spreadsheet looks like for my Twitter content. I only change a few posts in this every week and keep other posts like where to find me on Instagram and Snapchat the same. Then I down the spreadsheet as a CSV file and upload it to Bulk Buffer, which schedules all of that uploaded content right into Buffer. Here’s a screenshot of what my Instagram spreadsheet looks like. Now, although I can’t download a CSV file and upload through Bulk Buffer like I do to automatically schedule my Facebook and Twitter content, I still use a spreadsheet to plan out my Instagram content because it helps me visually see what pictures I’m sharing, what my captions are and what hashtags I’ll be using plus the link if I need to update it. From there, I schedule my Instagram content in Later. And no, spreadsheets don’t work for Pinterest in this case, but that’s ok because I just use the looping feature in Board Booster and call it a day. I literally set my Pinterest on autopilot. Yes, I can add more pins as I go along, but the looping feature is fantastic! You can get a step-by-step checklist of how I plan out and automate my social media and premade templates in my Super Simple Social Media Scheduling guide. This comes in handy for taking pictures for Instagram especially! About once or twice a month, I set aside a few hours to take pictures for my blog and social media. Either that day or soon after, I set aside time to edit all of the photos. Because of batching, I’ve even been able to schedule out a whole month’s worth of Instagram content. Essentially, I batch out when I schedule out my Facebook and Twitter posts. I sit down once a week for about an hour and schedule a week’s worth of content out. I don’t go back to the spreadsheet, Bulk Buffer or Buffer until the following week. More time to spend on other parts of my business now! I mentioned Buffer before and I can’t say enough how much I love it! There are plenty of other scheduling programs like CoSchedule and Hootsuite, but I’ve used Buffer from the beginning and never looked back. Plus it works alongside Bulk Buffer so well and makes scheduling my Facebook and Twitter content so incredibly easy! I schedule my content out and don’t worry about until the following week. Because I schedule my content out, I don’t feel like I need to be attached to my phone and laptop anymore to post content out. Even though I am a big fan of scheduling and automation, I also realize the importance of showing up and being present. I think it’s important to be honest with yourself and figure out whether you have enough self control to close the Facebook tab and just focus on finishing up that blog post you’re working on. Back in college, my friend used to give me access to her social media accounts and change the passwords during midterms or finals when she really needed to focus. The same applies to this situation. Only you can use apps, plugins or extensions to block you from scrolling through Pinterest when you really should be working. I personally don’t use apps or extensions like these because social media is my job, so I would literally be preventing myself from working. However, I do limit my personal use on social media. So yes, sometimes I need to be on Facebook, but it’s not because I’m checking in on my favorite groups or watching those recipe videos everyone loves. It’s because I’m working on a client’s account. Decide which option is better for you: using an app to block yourself from checking in on your social media or limiting yourself to how often you check in on your own social media. I schedule short chunks throughout the day to check in on my social media. You can even set a reminder for yourself so you can focus on your work, knowing you’ll get a notification when it’s time to check in on your favorite platforms. With these five tips, you’re sure to handle social media like a boss and take back your life! No more hiding in the bathroom at work to check how many likes your most recent Instagram post received (you know you’ve done that before!). 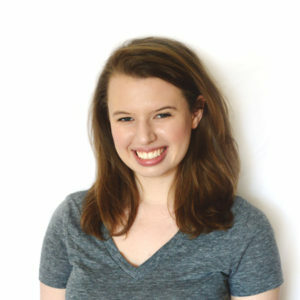 Melissa Hebbe is a social media strategist for boutiques, shops and product sellers and blogs all about social media marketing over at melissahebbe.com. 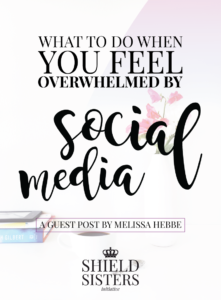 Since Melissa likes to keep the social in social media, she believes all platforms are a great way for boutiques, shops and small businesses to stay connected with their customers and audience. 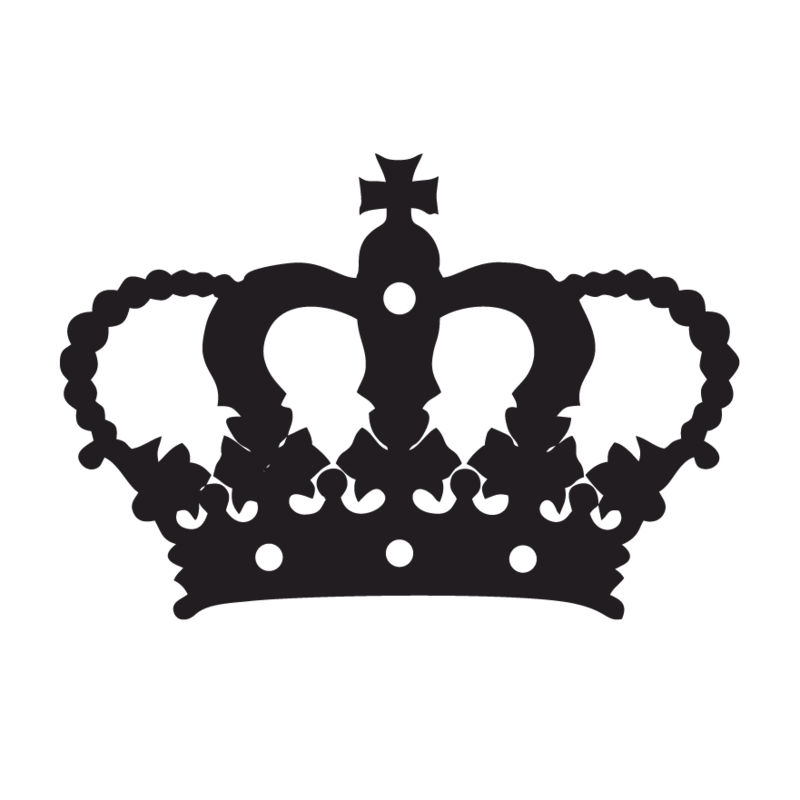 Thank you to Melissa for the fantastic guest post! Want to guest post for Shield Sisters Initiative? You can apply to become a contributor right here. Loved this post, Melissa! Thanks so much for contributing! This is an EXCELLENT article.